The Taihe Gemini portable monitor makers had a presence at CES 2019 and followed up with a nicely timed Kickstarter campaign last week. Now, just a week later, the project has raked in pledges 65X greater than the funding goal. AT the time of writing the Kickstarted project has raised $650,000, way beyond its funding goal of $10,000. Such a popular, successful, portable monitor project must be filling a significant market niche, and is obviously worth a closer look. 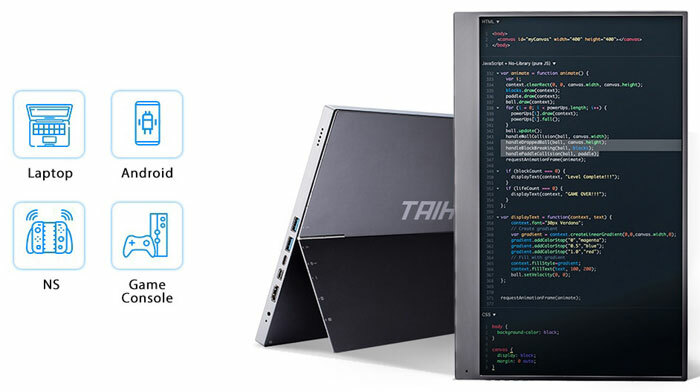 Chinese firm Taihe headlines its Gemini as the world's "most affordable on-the-go monitor". Certainly there are lots of existing similar sized portable monitors available and there have been for a few years but the thoughtful mix of features provided by the Gemini design seems to have hit a sweet spot. Firstly, regarding the headlining price, you can help fund the project and be offered a 1080p resolution, 72% NTSC gamut, Gemini with touchscreen feature for $219. The pledge level of $299 allows you to opt for the Gemini UHD (no touch, add $120 for touch option) with 100% Adobe RGB. 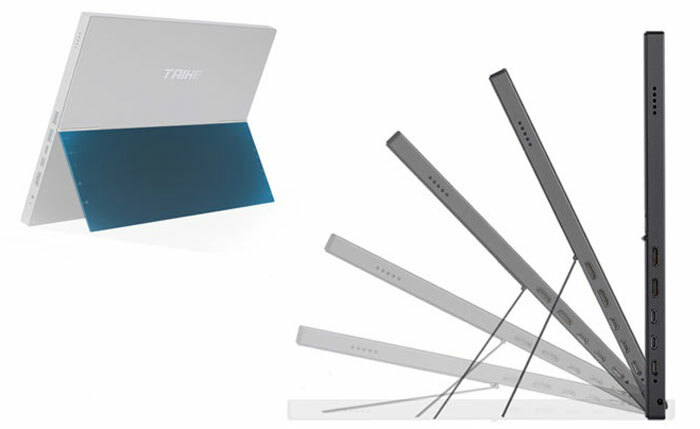 Both monitor types have 15.6-inch 60Hz anti-glare IPS screens with max brightness of 300cdm2. Convenience: Surface-style kick-stand on the back of the monitor allows for various tilt views and landscape / portrait orientations. Connectivity: Gemini FHD has 2 x Mini HDMI, 1 x Type-C, and 2x Micro USB ports. Gemini UHD has 2 x USB, 1x Type-C, 1x Mini DP, and 1x HDMI ports. Plus hardware controls for power, up, down, setting, input select. Speaker and headphone jacks. Since the project went live a week ago it has already passed a couple of so-called stretch goals. The result is that Taihe has now pledged to upgrade the USB 2.0 ports to USB 3.0 ports, and everyone will get a free screen protector in the box. If the project surpasses $800,000 in funding then everyone will get a multifunctional bag for the screen in the box too. It is expected that products will start to ship from May 2019 onwards and the firm is "very confident" it can meet its production schedule due to its previous experience. Remember that there is a chance that this project, like some previous Kickstarter and IndieGogo projects, could fail. It's definitively tempting for that price, if you have a use for such a device. The specifications are great and the range of available ports meets almost all demands. I would be interesting to know if you can use some kind of stylus to use it as a some kind of graphical tablet. This falls into the category of “thats pretty cool, but I don't have a use case for it” type of device. 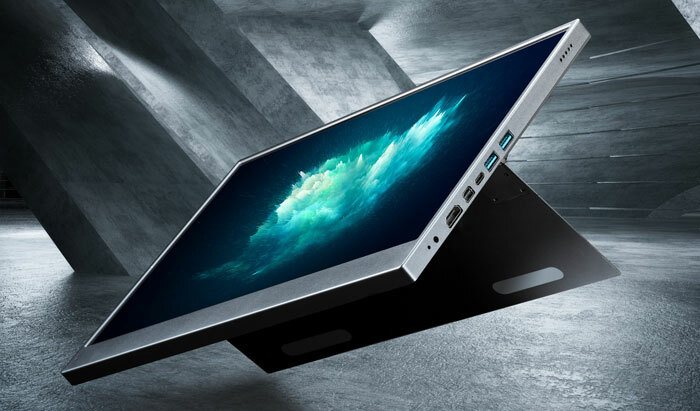 It is really cool and I do kind of want one…but I can't honestly see what I would use it for where there isn't a better device out there already. I really, REALLY, want a bolt on screen for my laptop when I am out of office and travelling. Multi screen is a blessing and I hate only working on a single screen but this seems to cut the mustard! ..well.. for the price why not include an ARM processor? Why would they? It's expensive enough as it is being a rugged touchscreen device running at 60Hz with a battery. What would be the purpose of the ARM processor? Put some android on it?